A ‘Bloody Nose’ Strike on North Korea Is Certainly Risky. Is It Crazy? 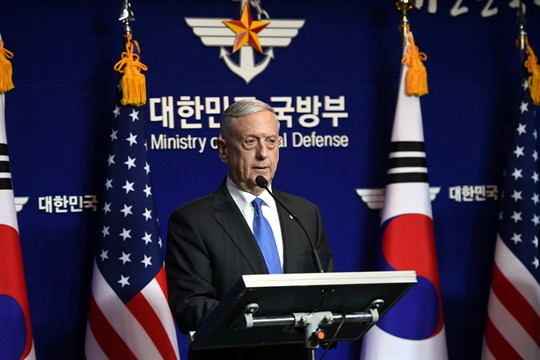 U.S. Secretary of Defense Jim Mattis speaks during a press conference with South Korean Defense Minister Song Young-moo, Seoul, South Korea, Oct. 28, 2017 (Pool photo via AP by Jung Yeon-Je). Over the past few months, the Trump administration has reportedly been mulling a limited, preventive military strike against North Korea, what has been called the “bloody nose” strategy. Pushed hardest by President Donald Trump’s national security adviser, Lt. Gen. H.R. McMaster, it is based on the belief that if North Korea has the ability to strike the United States with nuclear weapons, Washington would be deterred from intervening on the Korean Peninsula, thus allowing Pyongyang to step up its aggression against South Korea and other nearby nations. The only way to prevent this scenario, the thinking goes, is a military strike against North Korea that doesn’t eliminate its missile and nuclear weapons facilities entirely, but signals American intent to keep Pyongyang’s nuclear program in check. The U.S. gives Pyongyang a “bloody nose” without provoking an all-out war.